No you are not mistaken, the lobster really is currently the most trendy of all sea creatures (except possibly the mermaid - which just beats it with its glorious shimmer). Some of my favourite pieces from this trend include: gorgeous plush blue lobster pumps from Kurt Geiger, a quirky swimsuit and glittery pink socks both from ASOS and a kitsch lobster cardi from Collectif London. 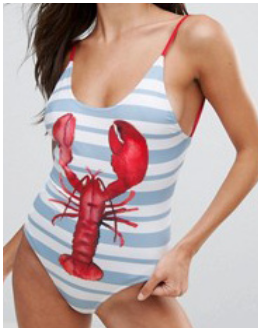 I am pretty sure the lobster pool lilo is now on my shopping list for next year’s holiday too, although at £47, I am not sure that my bank account agrees with me. For the special lobster in your life this beautiful lobster charm from Annoushka is set in rose gold and packed with diamonds and sapphires a snip at just £995. Lobsters are not only showing up on our clothes and accessories, but also appearing as homeware and even as a cute lobster toy for your beloved pets. Even if you don’t fancy the print, but would still like to embrace your inner lobster, then give Shellac’s Lobster Roll on your nails a go - sassy and on trend. So will a lobster be your catch of the season?